Suggested Age Group: 4-8, 6-10 Publisher, Year: Doubleday Books for Young Readers Country/Continent: The Whole Wide World! 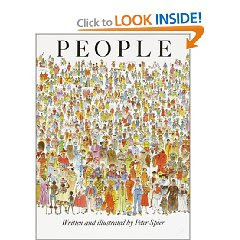 Halfway through reading Peter Spier's People, it occurred to me that if someone were to write a condensed Introduction to Human Beings, this would be it. There are pictures of people spilling out of every page and fascinating facts about people fill up every nook. For starters, we're told that people come in all sizes, shapes, heights, colors, with different eyes, ears, noses, lips, hair. To prove his point, Spier shows us 56 different facial profiles. Yes, fifty-six; and no two are alike. That is just to show a sample of how many different kinds of noses adorn faces. Page after page, we see glimpses of different cultural elements from around the world - traditional clothes from Nigeria, Java, Peru; games played everywhere - Bocce in Italy, Parchisi in India, Fish fighting in Thailand; different kind of dwellings people build for themselves, pets they keep, festivals they celebrate, food they consider delicacies, religions they practise. An entire spread is dedicated to languages they speak - we see Ethiopic, Syriac, Mongolian, Devanagari and Dravidian scripts. It is easy to get overwhelmed by a book packed cover to cover with such wealth of information. People is not meant to be finished in one sitting, it is like an encyclopedia, something to visit in little doses, something that is sure to create an awareness in a young mind about the many cultures across the world, and spark an interest in at least one new cultural element. The illustrations themselves will take your breath away. For a sample, look at the front cover, every human in the crowd is depicted with significant detail to make him/her stand unique from his/her neighbor. If you're wondering about how so much can be conveyed in just 48 pages, the answer lies in the clever layout. Imagine looking at a photo album filled with wallet sized pictures except, every picture here is a hand-drawn watercolor sketch, followed by a caption that tells us just enough to pique our curiosity. The heart of the book lies in these words - "It is very strange: Some people even hate others because they are unlike themselves....They forget that they too would seem different if they could only see themselves through other people's eyes." How nice it would be if each of us could see our reflections in others' minds, the way other people see us! To filter that down to my preschooler level, we did a role play with me playing a vegetarian, and him pretending to be my meat loving friend. Both of us had to decide what to order at a restaurant. After some miniature scale conflict resolution and many laughs, we decided to accept that we both were different, but we could still be friends; that salad could co-exist with chicken. While the theme of People is timeless, the statistics and many cultural references, date back to 1988, the time of publication. A reprint with updated information would be an excellent addition to the home library. I did think that parts of the book - which touched upon mortality and hierarchy - would be more appropriate for the grade school and older kids. What I loved best were the numerous references to native cultures around the world. I was pleased to find pictures of the Moga Feast in New Guinea, a Bedouin tent in the Middle East, traditional costume of Kurdistan - things I've never seen in any other children's books. People is a great presentation and celebration of the diverse, rich, colorful world we've created for ourselves. Sounds totally amazing and worth hunting around the whole wide world! "They forget that they too would seem different if they could only see themselves through other people's eyes" - powerful words there..
We are all alike in our differences! Great choice for winding down day @ CROCUS. WHAT a stunning pick! They're never too young to hear this, and hear this they must because children of today are more global than ever and yet the world is getting less and less tolerant and not more. It makes me cringe when I hear two kids ganging up on the third (in my daughter's school) - 'Go away. You're a bad girl - because you're black in colour'. I wonder where they pick up these prejudices so early? On hold, on hold, yay, yay, yay! The front cover and the simplicity of the title are both impressive. Such books are so wonderful because they seem to prepare you for the experience that is probably going to make you understand what the book was talking about:) Great pick for the finale! 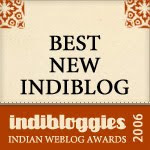 Kodi's Mom, your description of the book, the illustrations, the way you walked through the pages to show what it has to offer makes this review very useful! I particularly like that you mention it has to be taken in small doses - like an encyclopedia - and 'every picture here is a hand-drawn watercolor sketch, followed by a caption that tells us just enough to pique our curiosity' - makes me want to buy a copy for my library! Thanks! "Many people believe in one God...and millions of others believe in many gods. And many millions more do not believe in anything at all." I wish I had access to a book I can open and point out for every question like this.